Is there a country that, per capita, has produced more major loudspeaker brands than Great Britain? The British brands that immediately come to mind are Tannoy, KEF, Bowers & Wilkins, Quad, Rogers, Spendor, Harbeth, Castle, Acoustic Energy, ProAc, Monitor Audio, Epos, Celestion, Lowther, PMC—and Wharfedale. Founded in 1932 by Gilbert Briggs, Wharfedale is the second-oldest-established of the companies listed. Tannoy, founded in 1926 as the Tulsamere Manufacturing Company, can lay claim to being the first. And while Tannoy may have additional bragging rights for "the Tannoy" being a generic term in Britain for loudspeakers in a PA system, Wharfedale can argue that they literally wrote the book on loudspeakers: Loudspeakers: The Why and How of Good Reproduction, by Gilbert Briggs, published in 1948, with several follow-ups through the years (footnote 1). Like many other audio manufacturers, Wharfedale has gone through changes of ownership through the years, and is now part of the International Audio Group (IAG), which includes Quad, Mission, Audiolab, and Castle. The acoustic design of the Jade series is headed by well-known speaker designer Peter Comeau (ex-Mission, ex-Heybrook, ex-NXT); the speakers are manufactured in China. At the technical level, Wharfedale has made a number of innovations, the best known being speaker-cabinet walls filled with sand, and what Briggs called "aperiodic loading" of the cabinet and speaker. This is a kind of compromise between an open port and a sealed box, the air flow through the port being partially blocked, and thus having much of the efficiency advantage of the former and the improved transient characteristic of the latter. 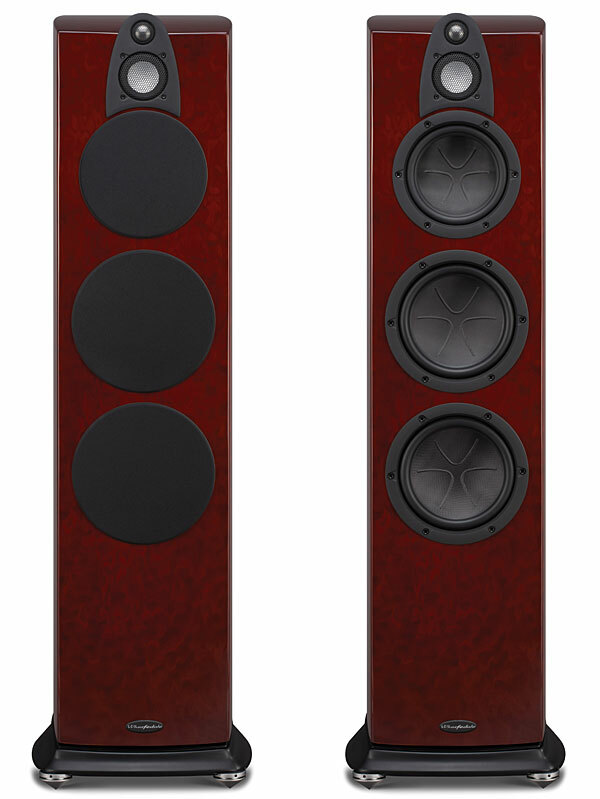 The 7 is the largest speaker of the Jade line, which includes two stand-mounted and two floorstanding designs, as well as models designed specifically for home theaters. It's a substantial-looking speaker, and its 82-lb weight means that it's solidly built. The front of the Jade 7 is curved, as are the side, converging at the back. Five finishes are available; the review samples were in Rosewood, which I thought looked a bit dull (my preference is for Piano Black), but when I asked my wife what she thought of the finish, the word she used was gorgeous—so I guess there's room for diversity of opinion here. The Jade 7 comes with individual round covers for its midbass and bass drive-units. These are not shown in the product brochure, and I think I know why: they give the speaker a dated appearance, and while they may provide some protection from people who like to poke speaker drivers with their fingers, I can't see the covers having any sonic benefit. I left them off for my auditioning. The midrange cone and the tweeter have permanent metal grilles. The drivers are designed and manufactured specifically for the Jade series. The cones are made of a proprietary material called Accufibre, which combines glass and carbon fiber in a self-damping woven matrix, and have a molded pattern designed to break up standing waves. The voice-coil features shorting rings to reduce inductance. The crossover networks are phase linear, and have been developed using measurements, computer modeling, and extensive listening tests. The Jade 7's cabinet is made of a new, proprietary, laminated substance called Crystalam, composed of natural wood elements and composites and designed to reduce panel vibrations and distribute resonances over a wider range. The Jade 7 uses a modern version of the aperiodic loading developed by Wharfedale founder Gilbert Briggs. Here, this consists of a space between the cabinet and the plinth that is filled with resistive porous foam that controls the air flow. One of the things that I've learned about reviewing audio equipment over the years is to avoid making snap judgments, especially with speakers. The sound you hear from a speaker when you first hook it up may not come close to representing that speaker's potential. Sometimes, slight differences in setup parameters (distance between speakers, toe-in, vertical angle, distances from the front and side walls) can make a considerable sonic difference. You may have the speakers set up in a way that you think is pretty close to optimal; then you move them a little closer together or farther apart, and suddenly the soundstage is more precisely focused—or more vague, in which case you restore the original inter-speaker distance. Even if you have the perfect physical setup—a perfection that, arguably, can only be approached, never attained—there may be changes in the sound of the speaker over time that constitute the break-in phenomenon. Almost all speaker manufacturers acknowledge that this phenomenon exists, but not all warn the consumer about it. It's important for a reviewer to base his or her conclusions on the way the speaker sounds after the break-in period, but how do you know when that period is over? You might think that manufacturers would put review samples through a break-in regimen at the factory, but, in my experience, they seldom do. Most of the time, the speakers the reviewer gets are from regular stock, with no prior break-in, and perhaps that's as it should be—that way, the reviewer is treated the same as the consumer. In the case of the Jade 7, Walter Schofield, VP of Sales and Marketing of Wharfedale USA, told me that the review samples had gotten no special break-in, but warned me that "the Jade 7s do like an extended break-in time." He suggested 120–150 hours, playing a wide range of music. My initial impressions, once I was satisfied that the speaker positions were about right, but before any break-in as such, were certainly positive: the sound was wide-ranging, with no obvious colorations or overemphasis of any part of the audioband, but dynamically on the "polite" side, somewhat lacking in transparency, and with the highs a bit muted. So I proceeded to put the speakers through the break-in recommended by Schofield. I played mostly orchestral music, at levels that were on the high side for me, as well as the break-in tracks of Nordost's System Set-Up & Tuning Disc (CD, Nordost CD NOR 101) and Monitor Audio's System De-Tox (CD, Monitor Audio). A couple of weeks after the speakers' arrival, my wife and I went away for a weekend, and I left the system playing Reference Recordings' Tutti! sampler (RR-906CD) at a fairly high level. That took care of some 60 hours of the recommended break-in period. And sure enough, on our return, the sound had changed in a very significant and positive direction. Were the speakers now well and truly broken in? The improvement was such that it was tempting to conclude so, but this was still far short of the recommended 120–150 hours; I kept my judgments in abeyance and continued to listen to music casually, leaving the system playing at a higher level when we were out of the house. Every once in a while I played some of my usual reference recordings, listening for any changes from what I'd heard before, and continued to go through the listen/break-in/listen routine until I felt that the sound of the speakers had truly settled down—which was close to the 150 hours of playing that Schofield had recommended. Compared to the pre–break-in sound of the speakers—with no changes in speaker positions, and no changes in the rest of the system (which was well past any possible break-in period)—the sound of the Jade 7s was now more open and more detailed, with crisper transients and subjectively more extended highs; in general, music sounded more lively and involving. I used two power amplifiers with the Jade 7: the Simaudio Moon Evolution W-7 (150Wpc, solid-state) and the McIntosh Labs MC275LE (75Wpc, tubed), both with the Convergent Technology CAT SL-1 Renaissance preamp, and the PrimaLuna ProLogue Premium integrated amplifier (40Wpc, KT88 tubes). The Jade 7 has a claimed nominal impedance of 6 ohms; a brief trial with the MC275LE, comparing the sound through the Mac's 4 and 8 ohm taps (neither the Mac nor the PrimaLuna has 6 ohm taps), showed that the bass was a little tighter through the 4 ohm taps, with no sonic downside that I could hear—so that's what I used with both the Mac and the PrimaLuna. The Simaudio and McIntosh amps, both rated Class A in Stereophile's "Recommended Components," were overall pretty evenly matched in driving the Jade 7s, but they certainly didn't sound the same. The Simaudio had a brighter, crisper sound, with more extended bass and less restrained high-level dynamics, but it lacked some of the McIntosh's harmonic "rightness" and smooth musical flow. Making the same comparison with the MartinLogan Montis speakers (see my review in the September 2012 issue), I preferred their sound as driven by the McIntosh. Comparing these amps with the Jade 7s, my preference was still with the Mac, but the degree of preference was less. Somehow, the Jade 7 led me to a greater appreciation of the Simaudio's positive qualities. The PrimaLuna ProLogue Premium is a relatively affordable integrated amplifier ($2299) that I've found to be a surprisingly good match with such exotica as the electrostatic hybrid MartinLogan Montis and the horn hybrid Avantgarde Uno Nano, as well with as the more conventional GoldenEar Triton Two. All of these speakers have powered subwoofers, which takes some of the load off the main amplifier. This was my first opportunity to hear the ProLogue Premium drive a speaker with a passive (ie, nonpowered) bass section. Compared to the Simaudio and McIntosh, the sonic character of the ProLogue Premium was much like what I'd previously heard through the speakers with powered woofers: a smooth, musical presentation, missing only some of the fine detail that characterizes the more expensive combinations of preamp and power amp. There was a little extra warmth in the midbass, and the bass was not quite as tight or as extended as with the other two amps (especially the Simaudio), but it wasn't notably deficient, either. If I hadn't heard the speakers with these other amps (not forgetting the contribution of the Convergent Audio Technology SL-1 Renaissance preamp, which alone costs $9995), I wouldn't have thought there was anything amiss. After an initial period of comparing amplifiers, most of my listening to the Jade 7 was with the McIntosh MC275LE. Except as noted, my descriptions of the Jade 7's sound refer to the speakers being driven by this amplifier. For most audiophiles, tonal balance is at the top of the list of attributes desirable in a speaker. If a speaker significantly departs from tonal neutrality—eg, if it sounds too bright or distinctly warm—it may still be preferred by some audiophiles, especially if it has other desirable characteristics (eg, startling dynamics) that make one overlook the tonal imbalance—but in that case, the speaker succeeds despite rather than because of its tonal characteristics. The Jade 7's tonal balance was about as neutral as they come. With well-recorded orchestral recordings, such as Eiji Oue and the Minnesota Orchestra's performance of Mussorgsky-Ravel's Pictures at an Exhibition (HDCD, Reference RR-79), the full range of the orchestra, from the shimmer of cymbals to the solidity of the bass drum, was presented in a way that sounded much like the real thing. A well-known principle of tonal neutrality requires that the treble and bass be evenly balanced. Judgments of tonal neutrality are subjective—as J. Gordon Holt pointed out in "Down with Flat," a measured flat frequency response does not necessarily translate into perceived tonal neutrality. As I write this, I don't yet know how well the Jade 7 measures—reviewed components are measured by John Atkinson, and reviewers don't see those figures until the review is about to be published—but whatever the measurements will show, it seems to me that the decisions made by the designer in balancing the frequency response of the Jade 7's drivers, and in blending their responses with the crossovers, has resulted in a speaker that did its job without unduly emphasizing or shortchanging any part of the audioband. As mentioned in the "Break-in" section, my initial impression was that the treble was on the soft side, but this pretty much disappeared after the speaker was broken in. Vocal sibilants, which can expose problems in the treble, were well controlled, perhaps just a bit deemphasized—which is far preferable to them being "spitty." In fact, the faithful reproduction of voices was one of the Jade 7's strengths. I have a CD of opera arias that was included with an issue of CD Review (now sadly defunct) more than a decade ago. I was quite fond of it, and used to play it a lot until, a few years ago, I misplaced it. It resurfaced while I was listening to the Jade 7, and I was delighted to hear it again. The collection (the CD insert identifies it as BMG Classics, but there's no catalog number, so I don't think it was released separately) includes several arias sung by Plácido Domingo, and it was a pleasure to listen to the sound of his voice in its prime, more effortless than in his later years. Through the Jade 7 and at an appropriately high level, it had a "ping" and power that presented a convincingly real impression. The Jade 7 also did well with the voices of the various sopranos represented on this disc: Leontyne Price, Monserrat Caballé, Renata Scotto, Carol Neblett, Ileana Contrubas, and Anna Moffo. The distinctive quality of each woman's voice was easily apparent. When it comes to evaluating bass performance, one of my favorite tests of speakers' bass extension is the low synthesizer note at the beginning of track 7 of Mickey Hart's Planet Drum (CD, Rykodisc RCD 10206), which the Real Time Analyzer of the iPhone AudioTools app shows as having a fundamental of 32Hz. Through many speakers, this note is present only in the form of harmonics, or is missing altogether. It was clearly there with the Jade 7, a firm note with a good sense of the fundamental rather than a doubled harmonic. The Avantgarde Uno Nano, MartinLogan Montis, and GoldenEar Triton II perform even better on this test, with more of a room-shaking effect, but each of those speakers has a powered subwoofer and, except for the Triton II, is more expensive. Perhaps more important than the sheer extension of bass is its quality: in the case of the Jade 7, the bass was tight, tuneful, and fast. How much of this was due to the use of aperiodic cabinet loading is open to debate—the design of the drivers, crossover, and cabinet must play important roles—but the combination as a whole simply worked. The timpani in Harold Farber and the All Star Percussion Ensemble's All Star Percussion (CD, Golden Strings GS CD 005) came across with crispness and as distinct musical notes, and I found it easy to follow the double-bass accompaniment on Sure Thing, Sylvia McNair's album of Jerome Kern songs (CD, Philips 442 129-2). The late Peter Walker, of Quad, suggested that there is a single "correct" playback level for every music recording. Although I'm sympathetic to this view, and often fiddle with the level to get an effect that sounds natural to me, I think that what people consider to be the correct playback level depends on several factors, including how "comfortable" a particular speaker sounds at various levels. Speakers like the original Quads, and classic minimonitors like the Rogers LS3/5A, sound great when played at relatively low levels, but push them a bit more and they start to sound strained, so you end up backing off the volume. With the Jade 7, it was almost the opposite effect: I found myself playing the speakers at higher volume levels than usual. The speakers seemed to thrive on this, with the dynamic punch of even larger speakers. This dynamic behavior also manifested itself in the communication of the music's ebb and flow. The soundstage produced by the Jade 7s was wide and deep, with instruments and voices precisely defined within the soundstage. It wasn't quite the best I've heard from speakers at around this price—that honor is held by the GoldenEar Triton II—but it was close. The ideal speaker would transduce the electrical signal into sound with 100% accuracy. But, as we all know, the ideal speaker does not exist. (At least, I haven't encountered it.) For speakers that comprise dynamic drivers in a box, such as the Jade 7, part of the challenge is to design drivers with low levels of resonant coloration and a box that similarly avoids having a characteristic sound of its own. This lack of resonant coloration would then allow the speaker as a whole to reproduce the musical signal without imposing on it a "sound" of its own, regardless of the type of music played. The Jade 7 approached this ideal to a degree that's rare in speakers designed with cost constraints. In fact, I found it difficult to get a handle on the Jade 7's sound, and finally decided that, for all intents and purposes, it didn't have one. With the otherwise-admirable GoldenEar Triton II, I am at times aware of a box resonance. Not with the Jade 7. The construction of the Wharfedale's cabinet, with its Crystalam laminated panels, nonparallel walls, and aperiodic loading, has produced an enclosure that is, to a large extent, sonically inert. For a speaker priced well short of cost-no-object level, this is a major accomplishment. As well as being low in coloration, the Jade 7 also evinced high resolution of detail without sounding etched or clinical. The percussion instruments in track 3 of the Chesky Records Jazz Sampler & Audiophile Test Compact Disc, Vol.1 (JD37) all had the requisite clarity, falling just short of the transparency I'd heard through the MartinLogan Montis. Listening to how a speaker reproduces familiar recordings is one way of determining its ability to resolve sonic details, and it's probably the most important. But a second, more audiophile- than music-lover–oriented approach is to listen to how the speaker responds to changes elsewhere in the system. Late in my auditioning of the Jade 7, I replaced the tubes in my CAT SL-1 Renaissance preamp. As far as I could tell, there was nothing specifically wrong with the old tubes, but I've used this preamp on and off for more than three years. I called CAT designer Ken Stevens, who said that retubing was definitely a good idea, and that he'd recently received a supply of 6922/6DJ8 tubes that were possibly the best he'd ever heard. The new tubes didn't result in a change in tonal balance, but I did hear an incremental increase in detail and dynamics that attested to the Jade 7's ability to reproduce the fine nuances in the signal it receives. The word that for me best describes the sound of the Wharfedale Jade 7 is balanced. Not just its tonal balance—which was almost ideally neutral—but a balance of the various sonic attributes most valued by audiophiles. Transparency, detail, soundstaging, and dynamics were all excellent—perhaps only a rung below what's available from more costly offerings. At $4199/pair, the Jade 7 is competitive with such speakers as the Focal Chorus 826W (reviewed in the November 2010 issue, Vol.33 No.11) and the GoldenEar Triton II (February 2012, Vol.35 No. 2), two of the best audiophile values available. The Jade 7 is a speaker in the classic tradition of Wharfedale. Gilbert Briggs would be proud.